Home • Recognition of Prior Experience and Learning (RPL) • Information and Guidance • Guidance for Higher Education and Recognised Qualification Providers • How do officers and staff apply? *If the applicant intends to apply for support from their force they should explore local policies at this stage to find out what they need to do. 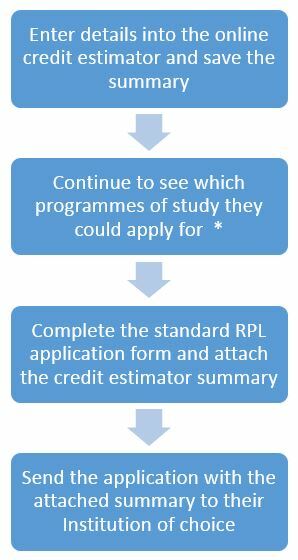 Officers and staff will use the new online tool to find out all they need to about the College RPL process, which learning providers have agreed to the process and how many academic credits they might be able to claim for their prior learning. The online tool contains Information and Guidance, a Credit Estimator tool and a Directory of courses and providers who have agreed to the College of Policing RPL process. The directory contains information on tuition fees, RPL fees, teaching methods and location of the course.